Abstract: Explaining why the universe contains more matter than antimatter remains an open problem at the interface of particle and nuclear physics with cosmology. While the Standard Model of particle physics cannot provide an explanation, various candidates for physics beyond the Standard Model may do so by breaking fundamental symmetries. Among the most interesting and testable scenarios are those that would have generated the matter-antimatter asymmetry roughly 10 picoseconds after the Big Bang. I discuss recent theoretical ideas for such scenarios, developments in computing their dynamics, and prospects for testing their viability with experiments at the high energy and high intensity frontiers. The early universe is not sufficiently out of thermal equilibrium. Another way to state this is that no first order electroweak (EW) phase transition occurred as the Universe was expanding and cooling after Inflation – although one is required to dynamically generate and preserve BAU. Within the Standard Model, the possibility of a first order phase transition was intimately tied to a Higgs mass of around 80 GeV, see for example PRL 77, 2887 (1996).. The generic scale of the coupling constant for a Beyond the Standard Model (BSM) CP-violating interaction is given by sin(φ) *(5 TeV)^2/M^2 where φ is a CP-violating phase and M is the mass of the BSM particle mediating a new CP-violating interaction. Generally speaking, Minimal Supersymmetric Standard Models (MSSM) that result in a strong first order EW phase transition and provide new sources of CP-violation can explain the BAU but also predict large electric dipole moments (EDMs). For the most part, these MSSMs are in tension with the non-observation of EDMs, particularly for the electron and neutron. They have not yet been ruled out completely by EDM experiments, see for example Physics Letters B 673 pp 95–100 (2009) . Model-dependent comparison of constraints, using recent LHC data with a Higgs mass of 125 GeV, derived from EDM limits from searches in electrons (ThO), neutrons, and diamagnetic atoms (Hg-199 and Ra-225) from PRD 89, 115023 (2014) are shown below. The ThO molecule is sensitive to the electron EDM as well as a nuclear spin-independant semileptonic CP-violating coupling between the electron and nucleus. Within the model presented in this paper, the semileptonic coupling constant is proportional to ratio of the product of the electron (0.5 MeV) and quark (1 MeV) masses to the square of the Higgs mass (125 GeV). For this reason, the semileptonic coupling is neglected and the ThO result is interpreted purely as a limit on the electron EDM. The result used is de < 0.87E-28 e*cm (90%) Science 343 p269 (2014). 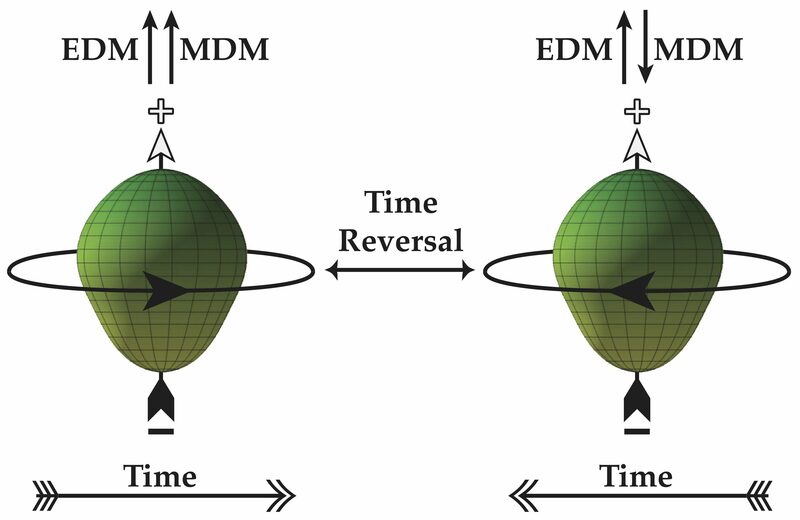 The neutron EDM is sensitive to quark EDMs, quark chromo-EDMs, and a purely gluonic CP-violating interaction represented by the Weinberg Operator, see Phys. Rev. Lett. 63, 2333 (1989). The result used is dn < 2900E-28 e*cm (90%) Phys. Rev. Lett. 97, 131801 (2006). The EDM of a diamagnetic atom, such as Hg-199 or Ra-225, is due to a combination of quark chromo-EDMs, the Weinberg operator, and a nuclear spin-dependant semileptonic CP-violating electron-nucleus interaction. Since this semileptonic coupling constant is suppressed by the masses of the electron and quarks relative to he Higgs mass, see argument above, this term is ignored as well. There are large uncertainties in the hadronic matrix elements for Hg-199 – but only the central values are used for this analysis. The result used is for Hg-199 with da < 0.31E-28 e*cm (95%) or da < 0.37E-28 e*cm (90%) Phys. Rev. Lett. 102, 101601 (2009). With all the caveats listed above, the current situation is that the electron EDM and the new Hg-199 EDM result (Phys. Rev. Lett. 116, 161601) provide comparable constraints. With all the caveats listed above, the newest results for the neutron (Phys. Rev. D 92, 092003 (2015)) and Ra-225 (Phys. Rev. C 94, 025501 (2016)) imply that a comparable neutron EDM limit is one order of magnitude behind while a comparable Ra-225 EDM limit is four orders of magnitude behind. One attractive feature about Electroweak Baryogenesis models is that they are more directly testable in the laboratory: new CP-violating sources via EDM searches and verifying the presence of a strong first order EW phase transition by searching for additional Higgs bosons of the appropriate mass. Leptogenesis, one of the strongest alternatives to EW baryogenesis, in this regard is more challenging. It requires an observation of CP-violation in the neutrino sector (searches underway, see for example T2K), Majorana neutrinos (neutrino-less double beta decay searches underway), and the See-Saw Mechanism (hard to prove but positive results on the first two make this very very compelling).